The optimization path of a compound through a design cycle is usually stepwise. Small structural changes generally result in small activity changes. The exception is when a small change of structure or electrostatics results in a large change in activity. This is known as an activity cliff. Activity Miner is a powerful software tool for identifying activity cliffs and, more importantly, understanding the reasons for them. Develop critical insights into the SAR that you will use to design new compounds. “I used Activity Miner to check new compounds against historical data on the project to make sure nothing was missed”. Using Activity Miner is easy. Run a simple Torch experiment (see the web clips here) then open Activity Miner. Three views highlight the relationships in your data and enable you to navigate through them. 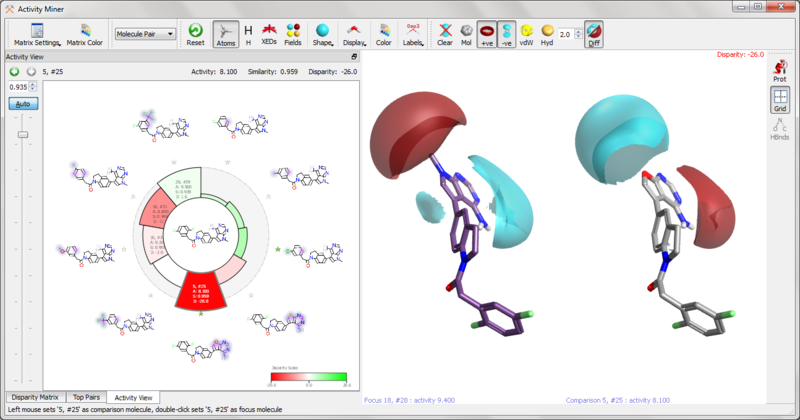 You can choose to use traditional 2D similarity as the basis for comparing molecules or Cresset’s 3D shape and electrostatic similarity. 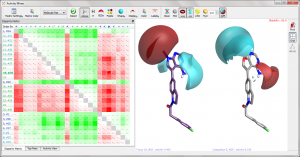 In either case you will be able to visualize the change in any pair of molecules in 3D in the protein active site, enabling you to understand the underlying reasons for the observed activity change. Uniquely, Activity View highlights how your two molecules differ electrostatically so you see the full implications of a change. For example, changing an heteroatomic group changes the electron density of the ring as well as introducing new interactions to the edge. Using the novel Activity View gives you a clear indication of the SAR focused on one compound. The near neighbors are arranged around the focus compound in similarity order with the changes to the structure highlighted. Segments are colored by the significance of the activity change with the focus compound with darker colors indicating greater significance. The view behaves like a browser enabling you to navigate from one interesting compound to the next, examining the SAR of close homologues on the way. At any time you can back or forward to cross validate any observations. The Top Pairs table shows you the most important relationships in your data. Use it as a way to quickly unearth the key changes that have been made in your series or simply to save all those substructure searches through the dataset. Every pair in the table is presented with activity together with the changes in the physical chemical properties like ligand efficiency, LLE or TPSA. Sort the table on any column or add your own favorite pairs to keep track the changes that you see as the most relevant for the problem that you are currently facing. The matrix view displays all your data in one place. The table can be sorted on title enabling you to find exactly the compound you are interested in. Alternatively sort it on activity to quickly see the anomalous compound in the set. 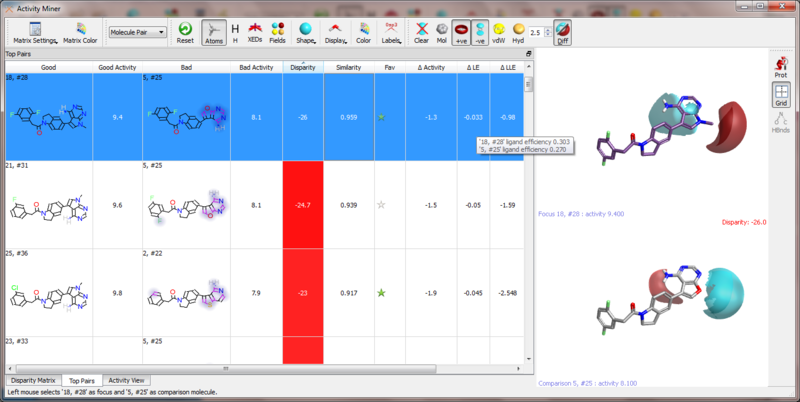 However it is sorted, you can zoom out to see all the relationships in your project or focus in on individual cells. 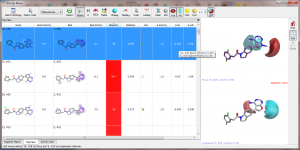 Navigating across the rows or up and down the columns gives you the comparison of one compound to every other in the project enabling you to spot those missing relationships or prove that the newly designed compounds are exactly the right ones. Want to see Activity Miner in action? Take a look at these web clips or try it on your project today. Every demo of Torch comes with the Activity Miner module enabled.